Anti-Oscillator-VCF-MFB VCA being opened by an Envelator in cycle mode. Simple just to show the filter. Modulation on the filter is courtesy the uLFO. LP, then HP, BP and then self oscillation. it self oscillates without even trying. my only complaint is that BANDPASS is much lower than the other two outputs. is anyone else experiencing the same with theirs? meaning a lower level when using the BP out? Yeah, that's the problem when working with spectral conditioning as compared to just playing with voltages. since it's slicing a chunk out of the middle, you loose energy on either end no matter where you put it. This is all done with the resonance backed off all the way. With it up, you loose more. Then, everything is dependent on the waveshape and harmonic structure of the source. Obviously, the majority of the waveform energy is at the fundamental. But, if the BP is too low for your taste, it's an easy fix for you DIY guys. R45 is a 100K 1% resistor going between pins 1 and 2 on the TL072. With the power connectors on your left, it's the lowest-left resistor between the 8-pin op-amp, the 12-pin CN3 connector and the closest resistor to the 4-pin power header. I changed mine to 330K and now, the LP and HP seem weak compared to the BP while using white noise for a source so, I'd suggest 220K to 270K. 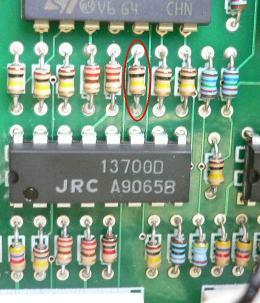 FYI: R51 between pin 6 of the TL072 and the transistors is a 47K 1% for the output amplification of the HP. Changing it to 100K is too much so, I'd suggest somewhere around 56K to bump it if you desire. hopefully my little demo did it justice. Let me know if you need a resistor or two Stephen. I added an input attenuator to my panel (50k pot from jack to ground, wiper becomes the input). What I'd like to do is increase the sensitivity of the filter input so that with no attenuation I'm overdriving the filter a bit. I'll probably fool around with resistor values so that with the knob at 3 o'clock it's unity. Shall I just lower this to 82K or something? The 100K (R6) to the right, next to it is the feedback resistor going between pins 6 and 7 on the IC above them. This makes a unity gain amplifier/ buffer prior to signal injection into the pole network. I'd change the feedback resistor (R6) and leave R5 as it is. The desired gain can be calculated by dividing the desired R6 value by the 100K R5 value. For example: if you replace R6 with a 200K resistor, it will amplify the input signal by 2. I never played with overloading the front end but, at some point it should start clipping. I did a little experiment boosting gain ahead of the filter and found this filter to be quite consistent sounding at different levels so I'm leaving it as is. Some of my filters are more particular. Thanks again for making these available. I love the versatility of SVFs. My build of this was largely an experiment in panel making so by starting with your preassembled PCB it was nearly instant gratification. I guess I'd have to call this is an FIY project, Finish It Yourself. Glad you are having fun. That is the point of all of this. Bridechamber and I are about to combine out VC Mixer kits for everybody in order to offer an entire FIY project. Essentially, you just assemble everything and solder the wires on the panel parts.